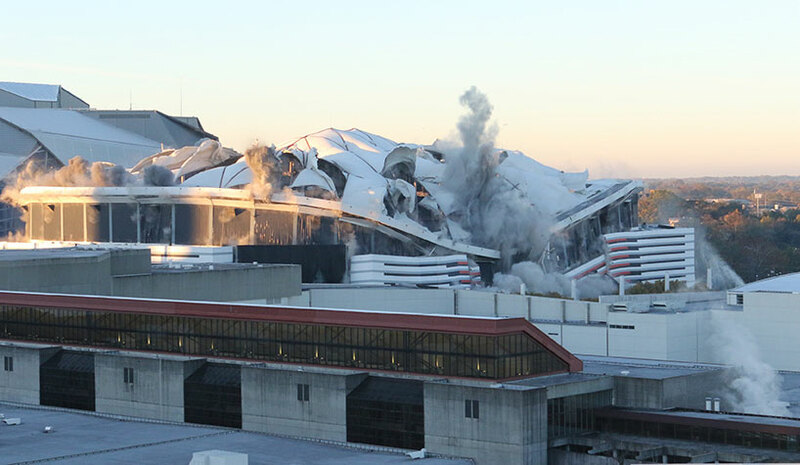 ATLANTA—The Georgia Dome was imploded at 7:30 a.m. Eastern Standard Time today. Taking 12 seconds to flatten, the implosion utilized more than 10,000 man hours of preparation, 4,800 total pounds of strategically placed explosives, and approximately six miles of detonating cord and one mile of electrical wire connections. The Dome was the only venue to ever host the Olympics, the Super Bowl, and the NCAA Men’s Final Four. Built for $214 million by the state of Georgia and operated by the Georgia World Congress Center Authority (GWCCA), the Georgia Dome opened in 1992 and served as home to the NFL’s Atlanta Falcons for 25 years prior to the team’s move next door to Mercedes-Benz Stadium, also on the GWCCA campus. More than 1,400 events took place at the Georgia Dome, drawing 37 million guests and generating more than $7 billion in economic impact. Cleanup is expected to take approximately three months, laying groundwork for a 1,010–room luxury convention center hotel serving the adjacent Georgia World Congress Center. Its groundbreaking is scheduled for early 2019. The site also will include a new 600-space parking deck and The Home Depot Backyard, a 13-acre green space designed for game day tailgating at Mercedes-Benz Stadium and community programming on non-event days. In related news, Atlanta recently welcomed another hotel addition to the city: the 127-suite Residence Inn by Marriott Atlanta Perimeter Center Dunwoody, GA, owned by Atlanta-based Hotel Development Partners (HDP) and managed by Hotel Equities. The hotel marks the third property owned by HDP and managed by Hotel Equities in the Atlanta Perimeter Center market. The other properties are the Hampton Inn & Suites by Hilton Atlanta Perimeter Dunwoody and the Fairfield Inn & Suites by Marriott Perimeter Center. Hotel Development Partners owns eight existing hotels in Atlanta, with a Courtyard by Marriott under construction in Alpharetta, near the upscale, mixed-use development Avalon.